Paneer, this fantastic Indian cottage cheese is our family favourite. We love this calcium rich Indian cheese in anything as anything. Obviously my fridge or either my freezer will definitely have enough paneer cubes to cook up. If you have paneer in your fridge trust me you make a couple of delicious dishes within few minutes. Since this cottage cheese is quite versatile you can do anything with it. From starter to dessert, you can make fantabulous dishes out of this Indian cheese.If you go through my recipe index, am sure you can see many varieties of dishes i have cooked out with this paneer. Actually i was searching for a simple gravy to have with some rotis few days back, instead of preparing the usual gravies with paneer, i picked this gorgeous looking gravy from Pari's space. Since i had a red capsicum in my fridge, seriously i want to give a try to this simple, quick and completely oil free gravy for our dinner. This gravy takes hardly less time to get ready and this eye catching gravy suits prefect as a side dish with rotis or else with simple pulaos. However we enjoyed this gravy with stove topped whole wheat naans for our dinner and very simply loved it. Bring boil enough water, add the chopped bellpepper,cashewnuts,green cardamoms, green chillies. Cook everything under the veggies turns soft, put off the flame. Keep aside and grind as fine paste once they gets cool. Heat a pan, add the grounded paste,paneer,red chilly powder,salt, cook everything in simmer until the gravy gets thick. Serve with rotis, naans or kulchas. What a vibrant color for the gravy !! Loved the pic !! 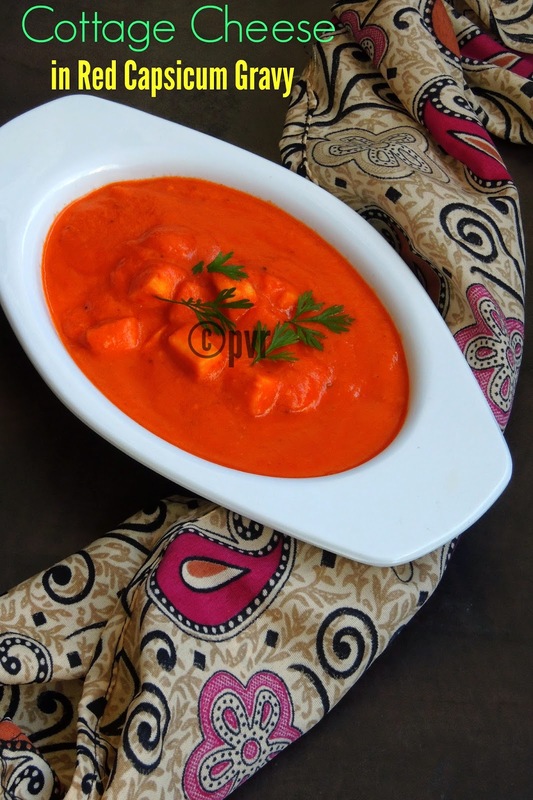 Lovely and colorful to look at paneer gravy. The red capsicum is making your dish so bright, vibrant and red. Nice! Thus gravy looks very very simple and i lOve the colour of the red bell peppers! I always use one red bell pepper in my tomato soup! I simply love this! Looks fabulous! Curry looks really delicious, love the vibrant red color..
Lovely colour and its a must try dish. Like the colour combination. A super tasty dish. I am in love with the color of the dish. Quick & easy curry. I always love less time consuming dishes. 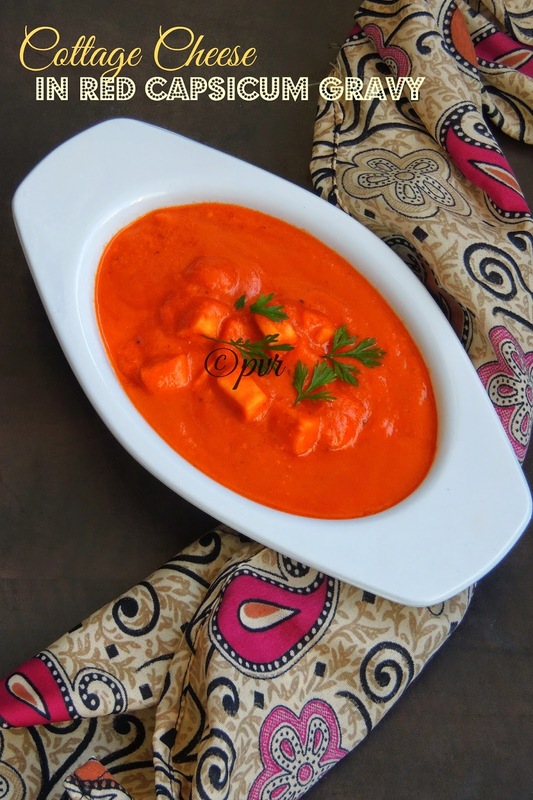 Just look at that vibrant colour..gosh this paneer gravy looks just too yumm...i missed so many yummy post from you..catching up with all now..
looks gorgeous!! all time favourite! Love the rich colour of the gravy .. superb ! This looks really colourful and delicious. wowww loved the colour of the gravy,just drooling here.. Such a vibrant color to the gravy,,,lipsmacking dish I m sure !! !